It seems that all the advice I've been giving lately is to wait, but in this case it's justified. The wait is still on for a tablet that can give competition to Apple's iPad. At the rate things are going, Apple will provide its own competition when it upgrades the iPad next year. But only two contendors - Samsung and Olive have launched devices and as a pleasant change, both have been officially released in India. And with Bangalore based Notion Ink annoucing an upcoming tablet with killer specs, it appears that India is in the thick of the tablet revolution. Only Apple is yet to officially launch the iPad though it sells unofficially through Ebay India for approximately Rs. 40,000 and upwards depending on configuration. At Rs. 25,990, India based Olive Telecom's Olive Pad was the first to launch and is also the most accessibly priced in India. It's an appealing toy for the price (if you can't source an iPad from abroad) with an ARM 11 600 Mhz chipset, 512 MB RAM expandable storage through MMC and a 7 inch capacitive touch TFT screen. It has a front facing VGA camera for calls and a 3 MP camera on the back. 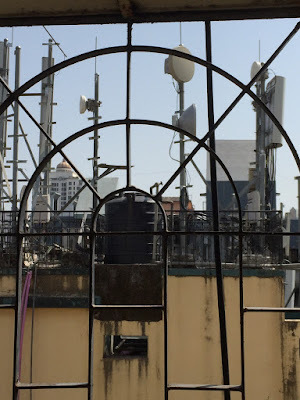 And it accepts a SIM card so it can function as a phone, or offer 3 G connectivity. The website announces that it now runs Froyo (Android 2.2) so it is completely up to date. Currently it is only available direct from the Olive Telecom site - I have not seen it on sale in retail stores. Would be nice if anyone could confirm that. One India reports that it will be hitting Europe soon. The Samsung Galaxy Tab, at Rs. 38,000 has been aggressively marketed by Samsung and is priced competitively with Apple's iPad in terms of grey market rates. Of course, you could get both devices cheaper if you sourced them directly from abroad. The Tab has similar RAM and screen size as the Olive, but it runs Samsung's speedy Cortex A8 1 Ghz Hummingbird processor, which is comparable with the iPad, unlike Olive's slower processor. It does not feature Samsung's SAMOLED screen, which is a disappointment; instead it has a TFT LCD. With both front and back facing camera and built in 3G like the Olive, the Tab provides a few features that the iPad does not. It runs Froyo and yes, it supports multi-tasking. Android Central provides the head-on comparison of specs with the iPad. 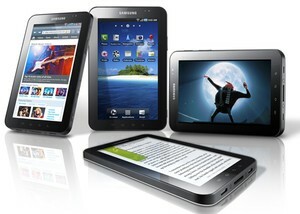 Samsung has faced a lot of comparison with the iPad and the reviews can be best described as mixed. PC World has done a round-up of reviews across sites and it appears that the Tab has its share of hiccups (notably that the touted flash capability is patchy, slow browsing experience and less display space than the iPad making usage less enjoyable). However, I did note that users were by and large happy with the product for what it was - a tablet offering the Android experience on a bigger screen, and in a more portable form factor than the iPad. In the US, this also means that non AT&T users get to sample a tablet. Personally, it is the pricing of the Tab that is an issue for me. Maybe head-on comparisons with the iPad were inevitable, but Samsung also asked for them by pricing head-on with Apple. I would have loved to see flavors of the Tab with different configurations (for example, only Wi-FI) and at a starting price point at least 100 dollars lower than what it currently is. Then, the party would have really taken off. I am sure that Samsung would be able to build the product at a lower price, as they did with the Wave. And if they chose to ship only a limited number of Tabs, a sold-out announcement would not have hurt their image either! As far as tablet phones go, the 5-inch QWERTY+touch screen Dell Streak is officially available in India since October 2010 though not sold directly by Dell. It retails at approximately Rs.35,000. The soon-to-come upgrade to Android 2.2 (Froyo) sweetens that price a bit, but not a lot. Next post, I will be blogging about upcoming tablets. There's a lot to write about and it deserves a separate post. As for the two tablets featured here, I will be frank and say that at this point, all tablets seem like expensive toys. Given the form factor, they really cannot substitute a phone. And they need to do a lot more in my book to substitute, say an ultraportable laptop, or even a netbook carried as a backup option to work on. I am not comfortable with full touch screen substituting a keyboard for work. As in, real work. As an add-on gadget, I think they are a great joy to have and play with, if you can afford that sort of thing. But I cannot see myself purchasing one of these unless the price drops to a range of Rs.15-20,000. And it will STILL be only a toy to me then. Checked out both the galaxy tab and olive pad at croma over the weekend; so you know that they are officially available off the shelf now. And btw; Samsung has announced a SAMOLED screen for the Galaxy Tab early next year. Also rumoured is an upgrade to gingerbread as soon as that's launched. Thanks Ramnik :) SAMOLED on Tab is good news, it was said that they are facing shortage of the screens which was why they did not put it on the TAB first time round. I am also excited about the Pixel Qi Display that Notion Ink will be offering on the Adam tablet. Going to write about that one next!